As winter blossoms into spring, the city comes alive with events, parties, and activities. Come to Philadelphia and enjoy the lively spring festivals, and, of course, the warm weather. With a prime location beside Rittenhouse Square, The Rittenhouse Hotel is minutes away from the city’s best attractions and festivals. During your stay in our luxury Philadelphia hotel, you can enjoy these upcoming spring events. Now in its fifth year, the South Street Spring Festival is a free, all-ages festival that spans over 12 city blocks. The massive festivities include 125 vendors, 35 restaurants, 40 bands, 3 stages, and 7 performance areas, all spread along South Street. Food trucks and local eateries will be offering diverse cuisine. For those craving a taste of Germany, the festival coincides with the Maifest Street Festival at Brauhaus Schmitz, a popular German restaurant on the 700 block of South Street. Brauhaus Schmitz will host traditional German music, authentic dancers, and the city’s largest maypole. The festival also coincides with Free Comic Book Day, and Atomic City Comics, on the 600 block of South Street, will celebrate with free giveaways and superhero sightings. The 38th annual Blue Cross Broad Street Run takes place during the first weekend in May. This race is an excellent time for participants and spectators alike. The race starts at Broad Street and W. Fisher Avenue, and it ends at the Philadelphia Navy Yard, at the southern end of Broad Street. The 10-mile course has been named one of the fastest courses in the country by Runner’s World. Music, cheerleading squads, and drill teams are scattered along the course, presenting entertainment for the spectators and motivation for the runners. Bleacher seating and refreshments are available at the Finish Line, and there’s even a Kids Fun Run, if you bring along the whole family. 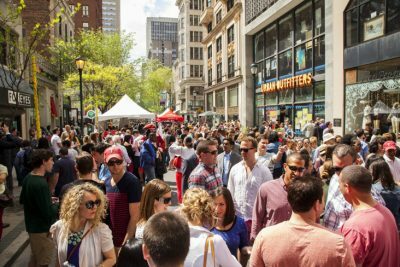 One of the city’s most popular festivals, Rittenhouse Row Spring Festival attracts over 50,000 people to Rittenhouse Square. Free to attend, the festival takes over Walnut Street with over 1,000 booths, featuring street cafes, art, beauty, fashion, family fun, culinary demonstrations, beer and cocktail samplings, live music, and entertainment. This local festival is right outside our hotel near Rittenhouse Square, making it easy for you to sample the delicious food, hear live music, and watch fashion shows. A stay at the Rittenhouse sets you in the center of Philadelphia, making it easy to enjoy all the lively spring activities in the City of Brotherly Love. Book directly on our website to get the lowest rate, guaranteed, at our luxury hotel in Philadelphia. We’ll be happy to welcome you to Philly.